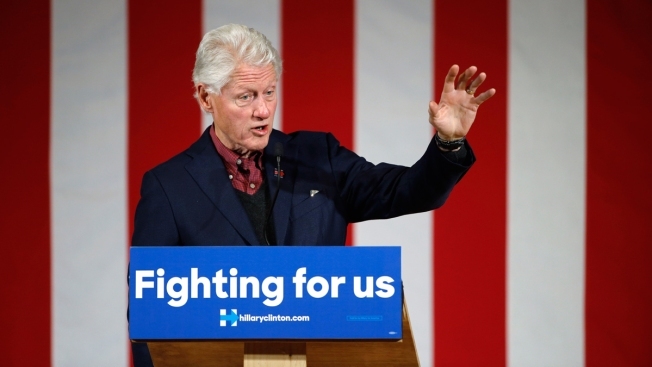 Former President Bill Clinton speaks during a campaign stop for his wife, Democratic presidential candidate Hillary Clinton, Wednesday, Jan. 13, 2016, at Keene State College in Keene, N.H.
Bill Clinton will visit the Bay Area to appear at two Hillary for America fundraisers on Jan. 25-26. He'll be in Hillsborough on the evening of Jan. 25 for an event hosted by Joe Cotchett, Nanci Nishimura, Congresswoman Jackie Speier and Barry Dennis at Speier's home, followed by a breakfast reception at a private San Francisco home on Jan. 26. Tickets for each start at $1,000 for a general reception and climb to $2,700 to also have a photo taken with Clinton. Hillary Clinton was in the Bay Area last week for her first visit of 2016, stopping at two fundraisers in San Francisco and one in Palo Alto.